"Whistling Dan," the man with the yellow eyes and untamed heart, is no more, but he left his girl-child, Joan, a vital legacy of wanderlust. The calling for adventure draws 18-year-old Joan Daniels from the comfort of her cabin into the mysterious northern country. At first, she's only looking to satisfy her restless curiosity. But a startling revelation ignites a desire to know her father's past, then she get an opportunity to clear his name for the future. "Whistling Dan" Barry was a wild soul, as alien to the bonds of civilization as an eagle to the bars of a cage. His spirit demanded wide spaces; he was forever hearkening for the magical call of the wild geese to follow on and on beyond the beckoning horizon. Whistling Dan appears only partly in the narrative, but from beyond the grave he weaves a magic spell over Joan, his child. This edition also includes an introduction ("The Mastery of Max Brand") to the "Whistling Dan" series, from the first publishing in serialized form in Argosy All-Story Weekly, June 30, where it continued until August 4, 1923. The novel is a sequel to the three foregoing stories, The Untamed (1919), The Night Horseman (1920) and The Seventh Man (1921). 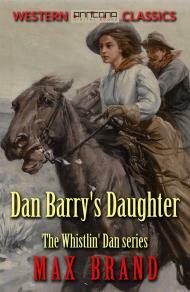 Dan Barry’s Daughter was first Serialized in Argosy All-Story Weekly in 1923.This edition is unabridged. Max Brand was the pen name for Frederick Schiller Faust (1892-1944) who was an American author known primarily for his thoughtful and literary Westerns.